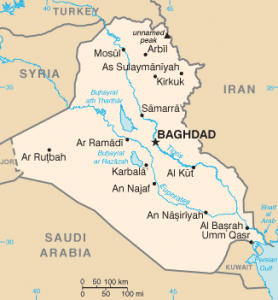 A suspected outbreak of the bacterial gastrointestinal disease, cholera,has killed at least six people in the Abu Ghraib area near Baghdad, according to an i24news.tv report. It is suspected that the disease was contracted by displaced Iraqis drinking Euphrates water. “Some people are drinking directly from the (Euphrates) river and the wells. The river water is polluted because the level is too low,” according to health ministry spokesman Rifaq al-Araji. The last time cholera reared it’s head in Iraq was in Kurdistan in 2012 when 4 people died. Cholera, caused by the bacterium Vibrio cholerae, is an acute bacterial intestinaldisease characterized by sudden onset, profuse watery stools (given the appearance as rice water stools because of flecks of mucus in water) due to a very potent enterotoxin. The enterotoxin leads to an extreme loss of fluid and electrolytes in the production of diarrhea. It has been noted that an untreated patient can lose his bodyweight in fluids in hoursresulting in shock and death. The bacteria are acquired through ingestion of contaminated water or food through a number ofmechanisms. Water is usually contaminated by the feces of infectedindividuals. Drinking water can be contaminated at the source, during transportor during storage at home. Food can get contaminated by soiled hands, duringpreparation or while eating. Beverages and ice prepared with contaminated water and fruits and vegetableswashed with this water are other examples. Some outbreaks are linked to raw or undercooked seafood.